A MAN and his wife were caught in a drug bust by Pardo Police Station operatives in Barangay Talamban, Cebu City at 5:30 a.m. Wednesday, Feb. 6. 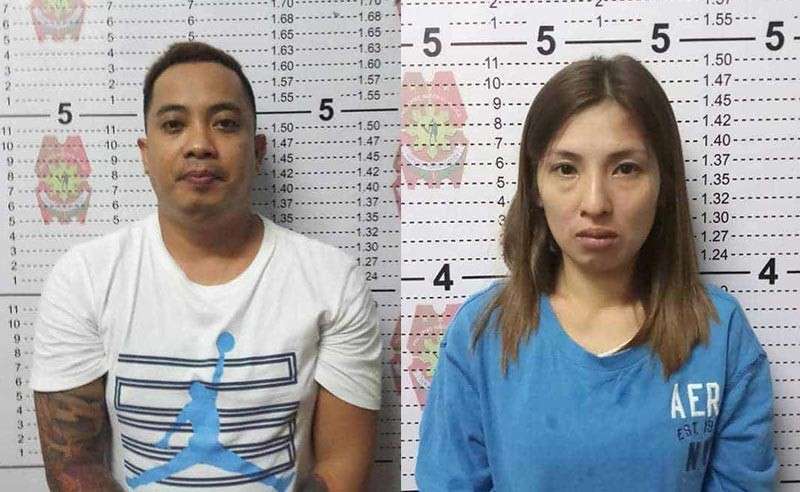 The suspects were identified as Arthur and Sheryl Cajes, residents of Sitio Lawis, Barangay Pasil, Cebu City. Seized from them were 55.4 grams of a substance believed to be shabu worth P360,100. Pardo Police Station Chief Regino Maramag said the suspects have been identified as big-time pushers. The suspects were identified as the underlings of Romy Ramas, an alleged drug lord operating in Metro Cebu. Ramas, an inmate of Mandaue City Jail, is reportedly still engaged in drug trafficking. Maramag said the Cajeses could reportedly dispose of 10 kilos of shabu per week. Before Ramas was caught, the Cajeses were reportedly his drug players in Pasil. The Cajeses’ distribution network reportedly reached Bohol and other provinces. The messages retrieved from the cell phones of Ramas and Arthur showed their big transactions. Based on the information from Ramas’s cell phone, the drug suspect was connected with the Chinese nationals whose house was raided by operatives in Luzon.